Trick or treat ?? Finally on the last day, I finished my Halloween Tag for the 12 Tags of 2012 October. 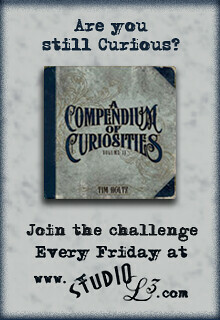 Look here for the monthly challenge of 2012 by the most creative man I know, Tim Holtz. So I'm joining the challenge. I followed the instructions, but at a certain time I had to make a change. The background of the tag I made like Tim demonstrated in his blog. I had to make my own tissue wrap, hahaha, ofcourse it teared. I had to be very careful when I put the paint and the ink on. I just drew the spiderwebs. And then I had to unclogg the nozzle of the Cosmic Shimmer Gold in hot water. But then it was so beautiful with the shimmer on it. I put the Black Glitter on the letters and glued them on the tag. The spider-embellishment was just what I liked on my tag. But then.... I didn't have the october stamp and I had to improvise... I had a cup of tea.... and I saw the paper where my teabag first in was. I liked it and I thought: Why not put it on my tag ?? I has a sentiment Autumn Storm and a leaf that blows in the wind on it. I clipped it and put some DI Tea Dye on it. To make it complete I finished it of with some little leaves. I just liked the colors. Halloween is something that is not a celebration here in the Netherlands so I made it more like a Fall tag. A black, orange and purple ribbon finished this tag. Well I love comments so don't be shy. Erg mooie halloween tag, Henriette! hij is erg mooi geworden, met je eigen draai er aan gegeven. Nu op naar de novembertag. Met welke kaart moet ik beginnen ? ?